Beginning November 15, 2017, Gemini’s best taker fee for liquidity-taking trades will be 10 bps (0.10%), on each of our three order matching engines: BTC/USD, ETH/USD, and ETH/BTC. Gemini’s best maker fee for liquidity-making trades will be 0 bps (0.00%), on each of our three order matching engines: BTC/USD, ETH/USD, and ETH/BTC. Market participants can achieve these favorable fee rates based on their 30-day trading volume. This new fee schedule will go into effect at midnight UTC, November 15, 2017 (7:00 pm ET, November 14, 2017), and then be applied to all trades going forward from that time. Note: we are removing the previous requirement related to maintaining a specific buy/sell ratio. 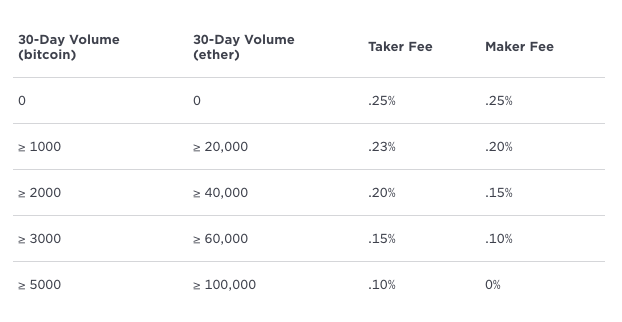 In addition, all trades executed in Gemini’s daily BTC/USD and ETH/USD auctions will be subject to the same liquidity-making fee schedule and will be included in your 30-day trading volume used to determine your fee rates. Please contact hello@gemini.com if you have any questions on the timing of this update and how it may impact your current fee schedule.